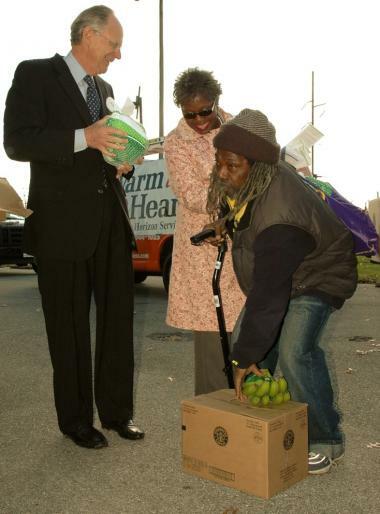 Wilmington, Del— A massive statewide initiative began today to raise $100,000 and 400,000 pounds of food to address a continuing demand for health and human service programs in Delaware this winter. Delaware Does More is a collaboration among local nonprofits, businesses, schools, faith-based organizations and others to help Delawareans with immediate needs for food, shelter and utilities. 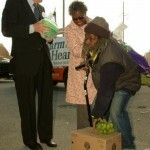 It is jointly administered by United Way of Delaware and Food Bank of Delaware. Dedicated supporters include Bank of America. Delaware Does More kicked off today with simultaneous events at Kingswood Community Center in Wilmington and the Food Bank of Delaware warehouse in Milford. At both locations, the Food Bank held a mobile food pantry, giving out 30-pound boxes of food, and Horizon Services and Delmarva Power provided information about heating and utility assistance programs. Delaware Does More started today and will end on February 28, 2009. To achieve its goals, the initiative is relying on members of the community to run fundraise and food drives. Last year, between the winter and summer installments of Delaware Does More, the community raised more than 1.8 million pounds of food and over $377,000. But as layoffs steadily increase, the community need is continuing to mount. As winter approaches, these needs are becoming more urgent. Patricia D. Beebe, President and CEO of Food Bank of Delaware, said that the success of Delaware Does More is essential to the well-being of thousands of Delawareans. Representative Mike Castle volunteered at the Delaware Does More kickoff, helping to distribute food. Also provided at the event was vital information about utility assistance programs from Horizon Services and Delmarva Power.